And many more related areas! 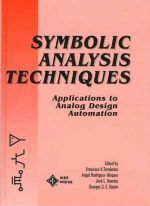 Symbolic Analysis Techniques also features an extensive comparison of modern symbolic analyzer characteristics and limitations. Brimming with practical instructions on tasks like formula simplification and post-processing, this book will be of use and interest to graduate students, researchers, and engineers involved in computer-aided circuits analysis and analog design automation.